1) Did you know that in 1887 Oregon was the first State to legalize Labor Day? Though it took a political disaster to get it on the National calendar. Find out more. 2) How to Stop Wasting Your Vacations. The science of finding happiness and restoration when getting away. “There is a pervasive societal belief that says to be successful we must stay plugged in and on top of tasks, but research shows doing this after hours and during vacations hampers long-term success. We are never giving our brains a chance to recharge.” Over a three-year period, the people who took more than 10 days of vacation had a 66% chance of getting a raise. Those who took less than 10 days had a 35% chance of getting a raise. One other thing, happiness comes from work and recovery. Read more. 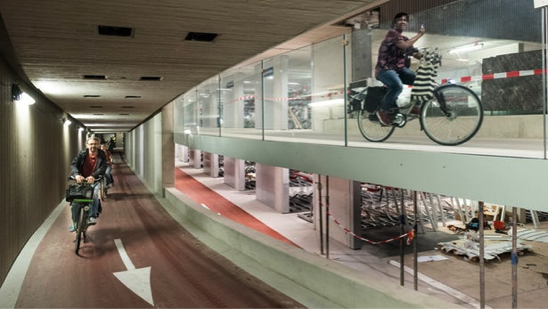 4) World’s biggest underground bike parking center opens in Utrecht. Traveling on a bike in the Netherlands is so popular that they now have a three-story underground bike parking structure. It is open 24-hours a day. 5) Silicon Valley is obsessed with meditation, and there is new evidence it changes the brain for the better. I have been teaching Mindfulness, Primordial Sound Meditation and Prayer of the Heart for some years now. For me, mediation has been a total game-changer in my life. If you do not have a practice, I would strongly urge you to start one. Find out why. The article also recommends retreats, please scroll down to see the ones I am leading. 6) 35 Affirmations That Will Change Your Life. “Affirmations are proven methods of self-improvement because of their ability to rewire our brains.” Basically, they help break up negative thought patterns which often lead to negative speech as well as actions. I like this one: “My thoughts are filled with positivity and my life is plentiful with prosperity.” Find your favorite affirmation. 8) Maya Angelou’s Top 10 Rules for Success. Love, love Maya. Rule number one, just do right. “Courage is the most important of all the virtues.” Find out the other nine. I am committed to helping those who sit in the overwhelm, constantly feeling out of time, and always stressed. As a longtime TV producer, I have been there many times over and have spent the last eleven years studying what to do about it. My promise is to get you out of the crazy and into the happy. To do that, I have put together a 90-day program. It is designed to be an ongoing curriculum that can fit into anyone’s schedule and can be joined online anytime. You will learn to manage your day-to-day world in a way that is sustainable. For a complimentary consultation, please contact me. I am leading a Prayer of the Heart Silent Meditation Walk and Picnic 9:30 am – 12:30 pm at Will Rogers State Park. Hiking level: easy to moderate. Length: 2-mile loop. We will meet in the parking lot, next to the polo field. Bring something for a picnic.